What’s the difference between good writing and bad writing? There are a gazillion answers to this question because both writing and writers are so diverse. No two readers are alike either, so one man’s work of genius may be another man’s birdcage lining. All strong writing is clear. It communicates without asking the reader to to do extra mental work. It doesn’t make assumptions about what the reader knows. It uses words and phrasing with precision. All this may seem obvious, but making clear to our readers what is clear to us is a surprisingly difficult task. Many common writing errors can get in the way: usage and mechanics problems, poor word selection, wordiness, and so on. Sometimes a writer’s words are fuzzy because his thinking is fuzzy. All too often writers fail to think through what they want to say before they start generating words. That’s where careful pre-writing can help clarify thoughts and direction prior to putting pen to paper. If your thinking is muddy, your writing will be too. Coherence is the way ideas hold together. Good writing moves easily from sentence to sentence, from idea to idea. There is a connection from one thought to the next that is naturally apparent. It allows the reader to follow your writing without getting lost. Like clarity, coherence depends on clear thinking, but it is also a product of well-handled transitions. Good writers know how to use transitional words and phrases to maintain coherence. Finally, good writing is economical with words. The best writing says what it has to say without wasted words. Perhaps the most important part of revising a paper is trimming the fat by eliminating unnecessary words, phrases and sentences. In quality writing, every word is important. There are no throw away phrases or extra padding. There’s far more to writing than these three concepts, but clarity, coherence, and conciseness are fundamental to all good writing. 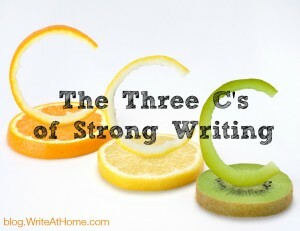 thank for these three inciteful C’s of writing! I enjoyed reading this article 🙂 great points to keep in mind! I’ve been fortunate enough to get a lot of my writing published, and most readers tell me that “clarity” is one of my greatest strengths. However, when trying to convey concepts to WriteAtHome students, I may think an idea seems clear, but young writers may not. I’ve had to upgrade my skills in this area. I like that. I really think like that too. But clarity sometimes doesn’t work in some cases. When a writer is being sarcastic, you see. If a writer is being sarcastic, he should be clearly sarcastic.